The Adventures of Fatman: Toxic Revenge is an excellent independently-published game by Michael Doak of SOCKO! Entertainment. Created with Chris Jones' popular freeware Adventure Game Studio, Fatman combines a wacky plot, a wonderful sense of humor, a user-friendly interface, and fun puzzles into a great adventure game that is well worth the $14.95 asking price. Fatman, who looks like Batman's more obese cousin, is the crime fighter for the city of Shadowlawn. Just when you are complaining about how dull things have been, a supervillain named Toxicman is created from a botched act of corporate sabotage. It is up to you, then, to tear yourself away from food long enough to save the city from certain destruction. The game plays like a typical point-and-click adventure game. Fans of LucasArts' classic adventures will instantly recognize the interface: commands at the bottom of the screen, next to the inventory window. Puzzles tend to be on the easy side, but there are several more interesting ones that require correct timing. All the puzzles are logical, although there is a few far-fetched ones that seem to be there only for the sake of lengthening the game. While you cannot compare the graphics to commercial releases, the cartoon style is consistent with the game's wacky sense of humor and comic-book-hero premise. Backgrounds are well drawn and animated, and there are few cases of hunt-the-pixel problems (most at the beginning of the game). Bonus points must be given to the cast of voice actors, who did a much better job than numerous commercial CD-ROM games. The designer himself and Francisco Gonzalez are especially outstanding as the voice of Fatman and Toxicman, respectively. In addition to full voice, the CD-ROM also contains funny outtakes, deleted scenes and animations, as well as Pizza Quest, Michael Doak's first game. Fatman also offers a few features that are not seen in many games. The first is an optional "behind the scene" audio commentary that you can press F12 to listen to from any scene. This is the first time I have seen this feature used in an adventure game, and the effect is a pleasant surprise: it feels similar to listening to the director's commentary on DVD movie, and adds interesting insights into what the designer had in mind as he designed each screen. There are also two gameplay modes: easy and hard. This does not change the puzzles, but the easy mode gives you hints and allow you to retry immediately when you die, so you will not need to save as often. 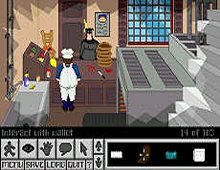 All in all, The Adventures of Fatman has plenty to offer adventure game fans. Although I wish the game had been longer - I finished it in less than 6 hours - the game kept me entertained from the beginning to end... something that cannot be said for the majority of today's commercial adventure games. You can buy the game easily by clicking on the PayPal button below. For $14.95 with free shipping to anywhere in the world, the game comes highly recommended. Two thumbs up, way up!